So, long time no see. A little bit of explanation before I get into what this random post is about. 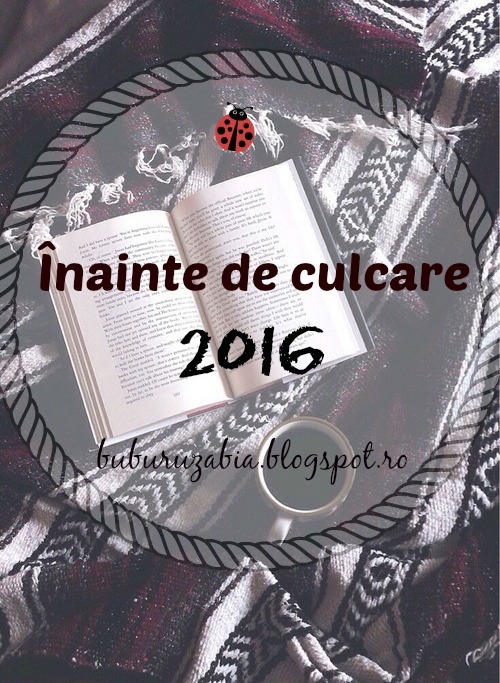 For the sake of the reading challenge the post will be in English, but I don’t know if I will keep posting in English or not. I guess this is my way of find out if my blog will change languages, since I’ve been playing with this for a long time, now. Maybe this is my fresh restart. Now, onto why I decided to post. I found just a few minutes ago about this amazing video game based challenge that is up from August 13th, meaning today, to September 10th, called #TheReadingQuest. 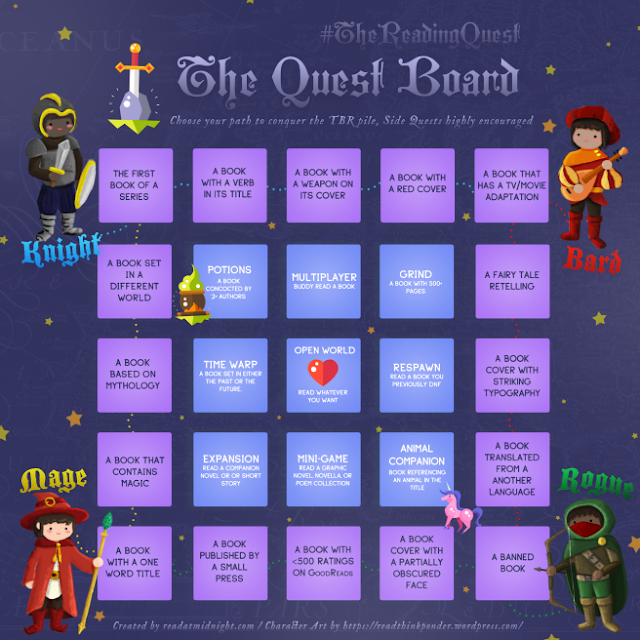 The challenge was created by Aentee at Read at Midnight and consists of literal quests for a character you choose: knight, mage, bard or rogue. Like I mentioned the challenge starts today, so as always I am late to the party, but ready to go. More information about the challenge you can find by clicking here, or on the name of the blog mentioned above. As of right now I think you can still sign up. You will have to choose a character and follow his path. You can choose another character only after you have finished the mandatory steps for your first choice. 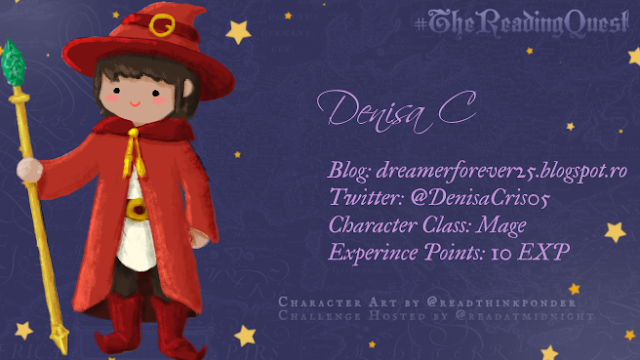 You can also design your character, with props given and edit with the name of your blog and obviously your name. Credit for the awesome illustrations goes to CW from Read, Think, Ponder. What helped me designed my character is a post from the blog Paper Wandered. It was very helpful. Now, after you click on all those links and figure out more details about this awesome #ReadingQuest, given how I’ve done such a wonderful job at explaining it, take a look at my not so set in stone TBR (to be read). So, since I choose the Mage, I need to follow his path or I can chose from time to time to do some of the middle challenges, side quests. Side note, first: I’m currently reading All the light we cannot see, but I will try to read and finish this soon, because I am not counting it for the challenge. 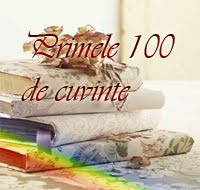 We have to start fresh and I am already 100 pages in. 3) A book based on mythology: The titan’s curse by Rick Riordan, and I will probably try and read the 4th and 5th if this goes well. 4) A book that contains magic: Miss Peregrine’s home for peculiar children, the first book in the same trilogy, by Ransom Riggs and again if everything goes well I will end up finishing up the trilogy. 5) A book with a one word title: Extras by Scott Westerfeld, I need to get around to this one because I love the Uglies series. These are my 5 quests for the Mage. It seems like a plan, does it not? And because I think this clearly is not enough I want to try some of the side quests because wouldn’t that be fun? 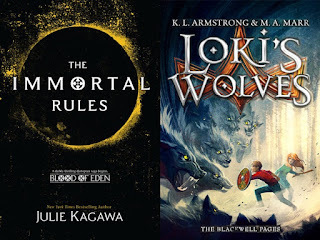 1) Time wrap – a book set in either the future or the past: The immortals rules by Julie Kagawa. For now I think this is enough. Hope you’ll join me in this quest and I hope I am not too late to the party, because I am already half behind. 11:53 am and I haven’t started a book. Hopefully I will post updates as well. See you then.